The CW's Riverdale is quickly becoming a "family affair," as Kelly Ripa pointed out on Instagram on Tuesday when announcing she's joining the drama as the mistress of Mark Consuelos' character, Hiram Lodge. That's right. Fans will soon see the real-life wife and husband on the small screen once again. Next to a picture of Ripa sitting in a chair on the Riverdale set wearing a little black dress holding what appears to be a whip, Ripa shared, "It’s a family affair……..Hiram’s mistress. 23 years of auditioning for a role i was born to play. Coming soon to the @thecwriverdale." The CW confirmed Ripa's upcoming role with the following statement released to Us Weekly on Tuesday: "Kelly Ripa will guest star on Riverdale as MRS. MULWRAY: Confident and tough, she is Hiram Lodge’s alleged mistress. She’s a beautiful, icy, femme fatale who gets caught up in a conspiracy that’s much bigger than she initially realized." How exciting and mysterious does that sound? Her role sounds perfect for Riverdale. Even Consuelos is thrilled about his wife guest-starring in an episode — and as his character's "alleged mistress." He commented on her Instagram post, "Yes please." 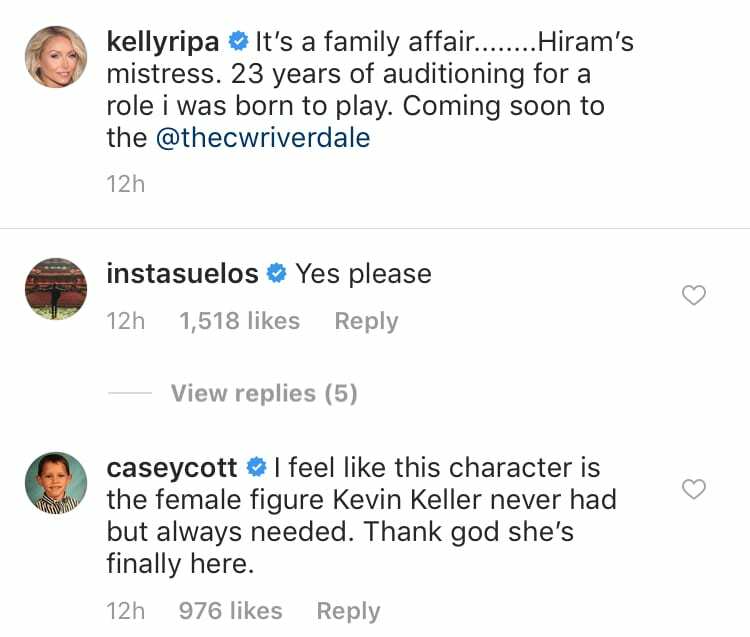 Riverdale cast members Casey Cott (who plays Kevin Keller) and Marisol Nichols (who plays Hermione Lodge, Hiram's wife) also expressed their excitement over Ripa's addition. Cott commented on her Instagram, "I feel like this character is the female figure Kevin Keller never had but always needed. Thank god she's finally here." Nichols wrote, "I am beyond, beyond excited for this to happen!!!!" This isn't the first time a member of the Ripa-Consuelos family has appeared on the show. During Wednesday's episode, Ripa and Consuelos' eldest son, Michael Consuelos, will be seen as a young Hiram Lodge. It's really the ideal role for him, especially since he's the spitting image of his father. As for Ripa's character, funnily enough, Consuelos spoke with Us Weekly in July about Ripa joining Riverdale as his character's mistress. "Wouldn’t it be great? She could play a nice little saucy character," he told the publication, before adding, "Hiram’s mistress or something like that?" Well, his wish came true. It's unclear when Ripa's episode will air, but it's definitely something for fans of both Riverdale and the beloved celebrity couple to look forward to.